• We hold honors such as the highest peer-review rating possible, AV Preeminent,* through Martindale-Hubbell. • We have obtained some of the most substantial whistleblowing settlements in the country. • We are committed to client confidentiality. • We have decades of combined experience in employment and business law. • We are aggressive in our pursuit of a client's goals. Additionally, the team at our law firm is highly involved in the legal community. Through groups such as the American Bar Association's Labor and Employment Law Section and the American Association for Justice, we have access to invaluable resources and personnel. 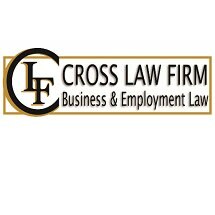 At Cross Law Firm, S.C., we have seen every side of the issues we regularly handle. Our attorneys represent individuals, factory workers, CEOs and corporations. We know what to look for when reviewing corporate contracts and policies. We have the ability to anticipate what may lie ahead for clients. This enables us to create legal strategies that preserve their interests now and far into the future. I contacted them because their listing on FindLaw indicated that they give a free consultation, but they secretary said that they don't usually do that, so I advised them to contact this website to remove that statement.